Do you ever get stressed out that you’ll forget something when packing for a trip? Or, have you ever gotten to your destination without a phone charger or a toothbrush? Last year, I started doing three new things with my packing list. They have been a HUGE help in the fight against packing stress and forgetfulness. Instead of creating a brand new list for each trip, start with a master travel checklist that you’ve customized for your needs. Spend time brainstorming everything you need on every trip. For example, I’ve found that I save a TON of money traveling with a reusable water bottle. But if it wasn’t on my list, I wouldn’t remember to add one to my bag. When your master list is ready, make a few photocopies. This list will give you a huge head start every time you need to pack. After a few revisions, I’ve perfected my list and I’m happy to share it with you! When you join the Insiders weekly email list in the box below, you’ll get an email with a blank printable packing list and my filled in packing list. About a week before you travel, grab one of the master list copies. 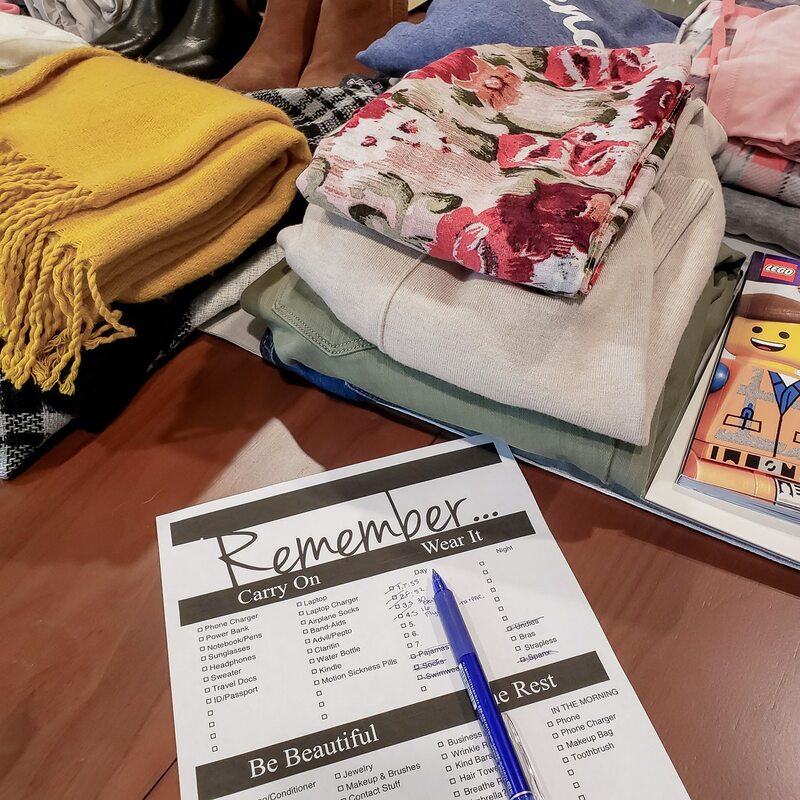 Start adding the extra things specific to this trip.In the clothing section, think about any special needs, like evening events that require dressier outfits. 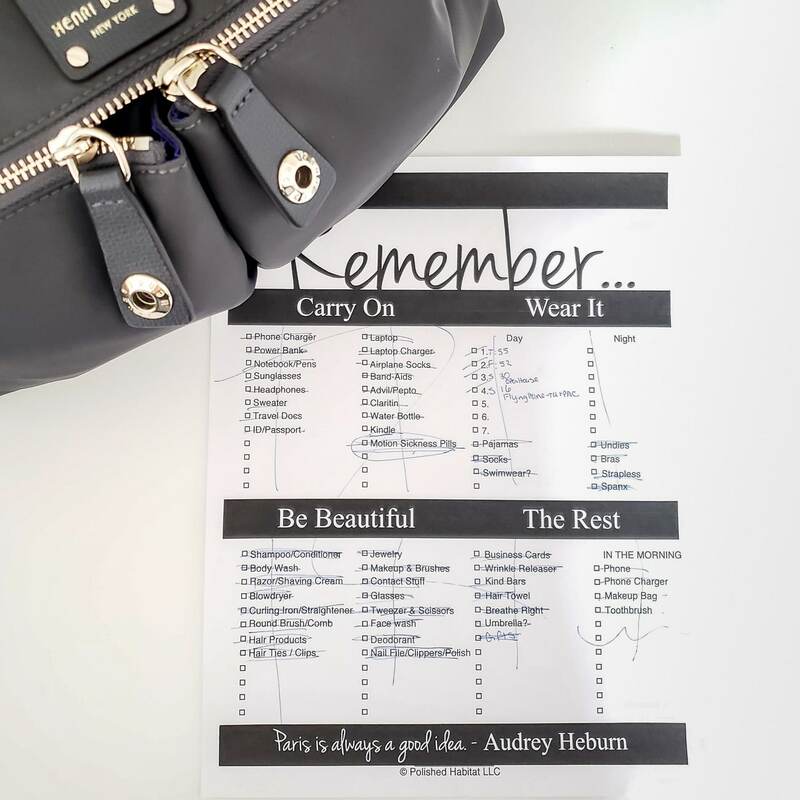 Leave the list somewhere handy so you can add to it throughout the week. When it’s time to start packing, keep the list by the suitcase and cross off items as they go in. This section has saved me so many times, especially with early morning flights! Keep a section of your packing list dedicated to the things that can’t be packed the night before. I also include anything that I’ll feel better if I double-check before leaving the house. The phone, phone charger, and toothbrush are always on this list. The night before your trip, make sure you’ve packed and crossed off everything possible. When I’m sure I have everything in a row packed up, I cross through it with a vertical line so I know I don’t have to worry about that group of items anymore. Move anything you can’t cross off to the “In the AM” section. You’ll sleep easier knowing you have a small checklist of everything you have to grab in the morning. I put the list with my purse before bed so I can give this section one last glance before heading out the door. Then, I leave confident knowing I’ve got everything I need. You can use these packing techniques on any piece of paper, but I love having a pretty printable packing list to fill out. Breaking down my list into categories helps me stay a little saner during the whole travel prep process. For more travel organization tips, head over to see how to pack a suitcase next! Last year when I visited Hong Kong, I listed everything I need forget the trips on a paper but end up lost that paper 1 day before I started to pack my stuff(still haven’t found it yet 🙁 ). I’m going to Singapore next month and I have already glued the packing list paper on my bed’s head. Anw, I love your “THE MASTER LIST”, really creative and unique. Thanks for great tips XOXO. Yikes! I would have been in a panic, but that is totally something I could see myself doing too! Great idea taping your list somewhere it couldn’t be lost. 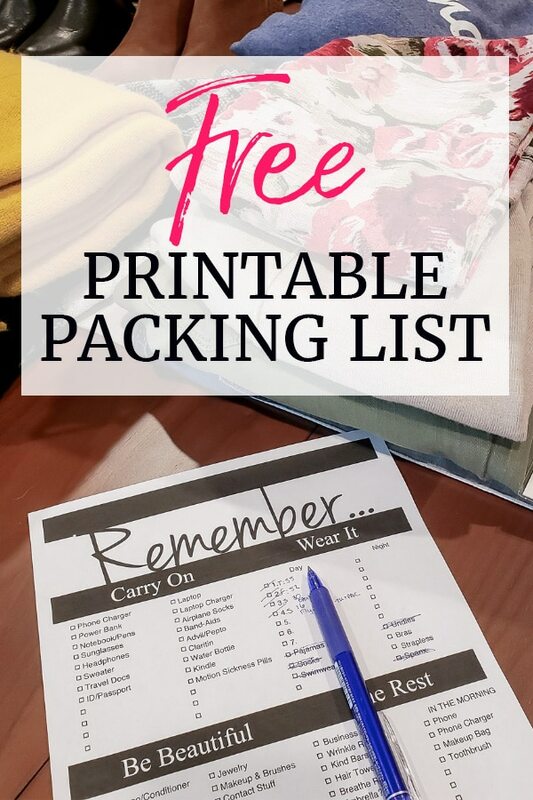 I love this printable packing list, it is very useful for me. I often travel 5-6 times per years and I cant avoid to forget necessary things. And i hope i can improve it with your master packing list, very creative. Wow, your master list looks so impressive. I have the habit writing my plan on paper or one notebook, and then I forget it sometimes. So bad!!! Love your master list Melissa! For the past 30 years, I keep a packed cosmetic/personal care bag and a season-appropriate quick change of clothes in an overnight bag. For a longer trip, I put together a wardrobe of coordinating outfits 3-7 days ahead of time. These outfits must fit in one carry-on bag. You’re not gonna leave me home baby! I would never put a suitcase on top of my bed. They are filthy from top to bottom. I put a large towel or sheet on the bed first. That suitcase was brand new so pretty darn clean!